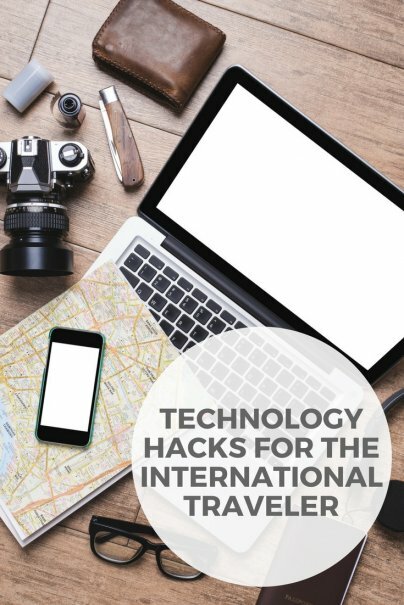 When traveling around the world, knowing how to use technology in the right way can save you time, money, and headaches while you are on the road. We've compiled a list of a few of the best hacks that allow you to use your smartphone and other devices easily when you're on your next trip. Your phone is likely one of the most important tools that you use while you are at home. You may rely on it daily for communication, navigation, social media, and personal banking, among other things. Using your regular cellphone plan abroad, however, can be pricey. Verizon, for example, charges $10 a day for you to use your plan outside of North America — meaning if you use it every day for a month, you could end up with a $300 bill. You can lower your costs significantly by using a cellular service provider in your destination country. For example, when I was living in France, a month of unlimited data and calling with Free Mobile cost just $20. To use a foreign carrier, you'll need to have your phone unlocked. Having an unlocked phone simply means that you can change your SIM card and get service from different carriers, as opposed to being stuck with one service provider that is locked to the phone. To unlock an existing phone, the first step is to ask your cellular service provider if it will unlock the phone for you. Most will, but you usually have to meet certain requirements, such as completing a two-year service plan if you signed up for one. Alternatively, if you travel a lot, the next time you're planning to buy a phone, you can buy one that is already unlocked. Unlocked Android phones can be purchased from Best Buy, and you can get unlocked iPhones from an Apple Store. If you already have a locked phone and your provider will not do unlock it for you, you can use one of the many shops that offer this type of service. In my experience, the price runs anywhere from $10 to $145, depending on the shop, the phone, and the carrier the phone is locked to. If you're going abroad, you can have it unlocked in your destination country, where it may be less expensive. For example, I found unlocking a phone in Mexico to be cheaper than doing it in the United States. Now that you have an unlocked phone, you'll need to purchase service by buying a SIM card at your destination. A SIM card is a small "smartcard" containing a chip that stores your mobile phone number, address book, and information on your cellular carrier and billing. You insert the SIM in your phone to get service from a certain provider. This means buying a SIM from, for example, France's Free Mobile will enable you to then buy coverage from them. You can usually buy a month's worth of service or prepay for minutes. You will get a new phone number and you can choose a plan depending on the quantity of data, calls, and messages you plan to use while abroad. A good data plan means that if you need to use the internet, you will no longer be reliant on a strong Wi-Fi connection. These plans are often just as fast as international phone plans offered by U.S. carriers — and they're often cheaper, too. In Argentina for example, Claro offers 50MB per day of data for one week for just 40 Argentinian pesos ($2.51 at the time of writing). Talk time is similarly inexpensive in many countries. When I was in Colombia, Claro offered 60 minutes of local talk time for 2,900 pesos, which equates to just 93 cents. Once you've gotten your phone connected and you're able to take advantage of cheap data packages abroad, you can get your computer connected as well. You do this by "tethering" the computer to your phone's data connection via the phone's "hotspot." Whether you need to work or you just want to upload some pictures of your trip, this can be a very useful trick for travelers. To get your connection going, you'll want to turn on your personal hotspot on your phone, which you'll find in your general settings, often in the same menu where your Wi-Fi connection is listed. From there, you'll turn the hotspot on so that it is searchable and viewable on other devices, in this case your computer. Some phones may have already created a password for you, or if it asks you to create one, make sure to select a strong password so others nearby you can't just jump onto your hotspot and use your data plan. Open your computer, click on your Wi-Fi connection, and you should see your phone appear as one of the hotspots. Enter the password and then you'll be able to surf the web from your computer, using the signal from your phone. You can also use your personal hotspot to give Wi-Fi access to a friend or travel partner if they don't happen to have a connection. They'll select your phone's hotspot from their list of Wi-Fi networks and enter the password. VPN stands for a virtual private network. I was introduced to VPNs when traveling recently to China. Using a VPN, I was able to access websites such as Facebook and Instagram, which the Chinese government blocks, as well as Netflix, which limits access to U.S. accounts in some countries. A VPN encrypts and reroutes your connection to the VPN provider's servers. It allows you to hide your IP address and your location; websites you're trying to access see the IP address and location of the VPN provider instead of your actual information. This helps when you're trying to access sites that geo-block access, such as Netflix. In addition, your local internet service provider won't be able to see which websites you're connecting to. It will only see that you're connecting to a VPN. That means you're more likely to get past government censors in the country where you're staying. Some VPNs are free, but they come with limited bandwidth. You're usually better off purchasing access for $5–$15 a month. Google Maps is the king of smartphone navigation apps, and you can even use it when you don't have a cellular or Wi-Fi connection. It takes a little advance planning, as you'll need to open the map of the place you're going — say, Paris — while you're online. Once you've got the Paris map pulled up, type "OK Maps" into the search bar. You can then save the map for use when you're offline. The Google Maps app will even give you driving directions within the saved area when you're offline, though you can't get walking or transit directions. Other apps such as maps.me let you download maps for a whole country. Maps.me also has a navigation feature that is entirely accessible offline once you've downloaded the map of your choice.